Bathmen has 5287 inhabitants, in an area of 2.645 hectares. image from the Bathmen municipal website. The arms of Bathmen is divided in two parts, with the Virgin Mary sitting on a throne to the left, with on her knees the Child Jesus. To the right are three chevrons on gold. The image of the Virgin Mary has been derived from the old chapter of St. Lebuinis in Deventer. The chevrons in gold has been taken from the arms of the former Lords of Dorth (see Gorssel). 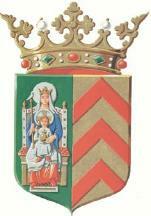 The CoA was granted on 21 Nov 1898 by the High Council of Nobility.